Turquoise Blue Oval Pearls 6x9mm with Spectacular, Electric Blue, Facetted 4mm Agates on Sterling Silver Chains, Rings and Hook. ALL sterling 925. A luscious touch of Cuban Nights in Real Pearls and Gemstone jewellery! This striking blue pearl cluster earring is all that may be needed to get that pop of blue for any occasion needing a blue jewellery accessory. A suggestion when looking for a particular coloured earring do a search using google images. 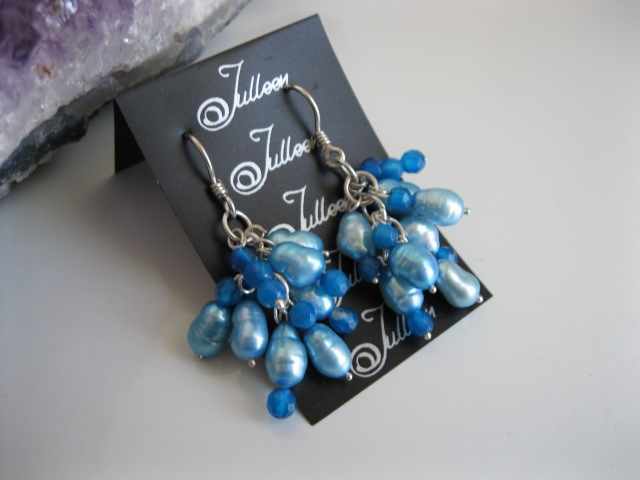 As with all Julleen Pearl cluster pearl earrings – give these a little shake just before you put it on. Voila! the lovely lush density of the bunch will return once again and look sensational!